The episodes in recent days, featuring the erection of barricades, destruction of public property and widespread violence by opposition groups bring back memories of the 2014 guarimbas.1 After months of violence, with certain neighbourhoods effectively under siege, and a death toll of 43, the opposition gangs slowly demobilised. But some analysts argue that this time it is different. With the right-wing coming to power in Brazil and Argentina and the permanent hostility of the empire, some international bodies have been neutralised and others, such as the OAS, adopted a plainly interventionist agenda against Venezuela. And as always when it comes to Venezuela, the empire and the local oligarchy make sure that their “war” on the streets is backed by a “war” through the media. So right-wing terrorists attacked one of the government’s flagship projects, killed a young boy, and the media reported that the government was to blame! A murder victim was turned into a martyr for the murderers’ cause. While this kind of manipulation may sound revolting, it is actually common practice. Through manipulation and a tremendously one-sided perspective, the mainstream media has worked tirelessly to fit every death and injury into the “authoritarian government repressing peaceful protesters” narrative. The violent opposition guarimbas of 2014 resulted in 43 dead people. A detailed look at all the victims and the circumstances in which they died shows that a few of them were opposition members, a roughly equal number were law enforcement agents, and the large majority were either government supporters or bystanders. And yet, the western media (and private media in Venezuela as well) will talk about “43 dead as a result of government repression” or “43 dead as a result of clashes with government forces”. If we are very lucky, we will read about “43 victims from both sides of the political divide”. But even this is misleading. Hanging a wire across an avenue and beheading a motorcyclist is not any kind of political statement, nor is the victim from this or the other side of the political divide. It is a plain murder. The Venezuelan police forces have on occasion been accused of deploying heavy-handed tactics, for instance, in the recent OLP (Operación de Liberación del Pueblo) campaign. But the fact is that law enforcement agents have been arrested and seen charges brought against them for negligent or criminal actions that might have resulted in injuries or death to bystanders or protesters, even if these were armed and violent. This happened a few days ago, when a bystander was shot dead by a police officer, just like it happened three years ago. It is a level of accountability that is miles away from the impunity enjoyed in places like the United States, where police officers can shoot an unarmed man in the back or choke someone to death without any real consequences. It might be a good idea for the Harvard Kennedy School, and other places that educate the children of the Venezuelan oligarchs, to include Machiavelli in their curricula. By reading “Il Principe” they would be aware of the dangers of hiring “mercenaries” to do their dirty work. After being paid, and especially if they are captured, the mercenaries’ commitment to the cause, in this case restoring the Venezuelan oligarchy to its former glory, may not be relied upon. Last week, one of the people arrested for the acts of violence and vandalism, Guido Rodríguez, confessed that he had been paid by opposition party Primero Justicia (PJ), the party of former presidential candidate Henrique Capriles, to vandalise and burn public buildings. Another captured member of the opposition also pointed the finger towards the higher-ups in PJ. For their part, PJ leaders shot themselves in the other foot with their reaction. Reaction from Primero Justicia Secretary General Tomás Guanipa: the left tweet from April 16 says “Guido Rodriguez swore in court that he was forced under torture to incriminate PJ and that it was all a lie”, and the right one from April 17 says “We have no idea who Guido Rodriguez is”. Another tally that the media keep, with the help of US-funded NGOs, is of people arrested. One can only imagine what would happen if a few dozen hooligans set up a barricade in Manhattan’s 5th Avenue, or looted shops in London, or set fire to public buildings in Paris. Or if snipers were shooting at police officers. Furthermore, imagine there was publicly presented evidence that leaders of an extremist party, like the French FN or UKIP, had actually paid for these activities. The media would be cheering their arrests for weeks. But just like all deaths caused by the opposition are to be pinned on the government, any and all arrests are also arrests of “peaceful protesters” for political reasons. One of the people arrested in 2014 was Lorent Saleh. After Venezuelan intelligence services intercepted communications in which he was planning bombings and assassinations, he was deported by Colombia and arrested. But in the intercepted videos, some of which were publicly shown, Saleh named former Caracas mayor and key opposition leader Antonio Ledezma as the main man who made all these violent plans possible. Yet when Ledezma was arrested a few months later for his involvement in another coup attempt, we only heard the familiar propaganda of the authoritarian government getting rid of the democratic opposition. It seems that in Venezuela being democratic means only that you are getting money from the National Endowment for Democracy (NED). The truth is always there to be found if we are willing to look beyond the lies and propaganda. The State Department, the OAS and media can call in unison for the release of “political prisoners”, they can throw their weight behind the opposition’s amnesty bill. All we need to do is look at the contents of said amnesty bill to find a detailed confession of all the crimes that the opposition means to pardon. It goes from arson to terrorism funding to tax fraud, with everything in between. By referring to people guilty of these crimes as “political prisoners”, the mainstream media has embraced its role as another front in the war against Venezuela. The opposition’s script is clear enough. With the national and international elites doing their part in the economic war and financial blockade, it is down to the political agents to do their part. This involves getting people out on the streets, something they have not always been able to do, and generating as much chaos as possible. 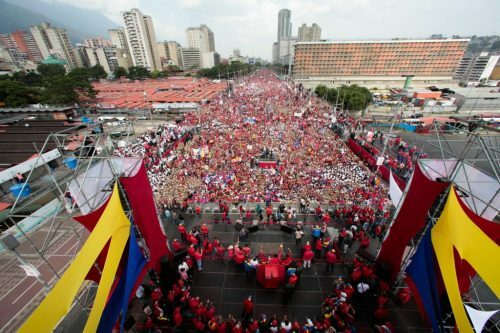 Since the media, both the private Venezuelan outlets and international ones, ensure that violence and death always work in favour of the opposition, their hope is to trigger a chain of events that would lead to a coup like in 2002, or to a foreign military intervention.3 Or, in the worst case scenario, wear down chavismo to secure a victory in the next presidential election. But this is far from guaranteed. The fact that there are these constant plots for immediate regime-change shows that the opposition, and its foreign backers, are very invested in a coup scenario. There is also a reason why the violent barricades are set up in wealthy eastern Caracas and not in the barrios of western Caracas. Even if they are the most affected by the economic crisis, the Venezuelan poor and working class have shown time and again that they are committed to this project that, for the first time in history, gave them a voice and a leading role. And they are certainly not willing to hand power back to the elites. This article was posted on Monday, April 24th, 2017 at 4:39pm and is filed under Disinformation, Fake News, Media, Narrative, Propaganda, Social media, Venezuela.